"The Human Whose Name Is Written In This Note Shall Die" are the archaic words of the Death Note Movie collection which is based on the acclaimed anime series of dark gods, corruption and morality. Death Note revolves around Light Yagami, a high academic university student who is plagued by the atrocities in the criminal underworld. Like all of us, Light Yagami is powerless to help in the war of order versus crime until one day... our highly achieving academic "stumbles" upon an ancient notebook which is known as the "Death Note" and prophecy states that "The Human Whose Name Is Written In This Note Shall Die". Yagami's mind begins to race... is this a joke? or is this real? This is the first psychological gap that Yagami makes as he writes the name of two criminals in the Death Note with horrifying results. Death Note is a paranormal psychological thriller which features the supernatural and a good old fashioned police thriller as one Japan's most mysterious and smartest detective "L" begins to investigate the serial killings of these criminals which begins a race of cat versus cat. Director Shusuke Kaneko does a brilliant job at transforming the original anime cartoon into a nail biting movie which features great acting by Tatsua Fujiwara and Kenichi Matsuyama in world of the unknown paranormal that has enough twists and turns in the movie to keep the viewer glued to the screen. 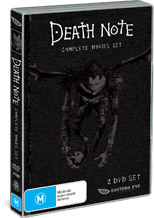 Presented in an aspect ratio of 16:9 widescreen with Dolby Digital 5.1, Death Note Movie Collection is a thrilling ride from start to finish with a plethora of special features.